This display all active Internet connections to the server and only established connections are included. Show only active Internet connections to the server on port 80, this is the http port and so it’s useful if you have a web server, and sort the results. Useful in detecting a single flood by allowing you to recognize many connections coming from one IP. This command is useful to find out how many active SYNC_REC are occurring on the server. The number should be pretty low, preferably less than 5. On DoS attack incidents or mail bombs, the number can jump to pretty high. However, the value always depends on system, so a high value may be average on another server. List out the all IP addresses involved instead of just count. List all the unique IP addresses of the node that are sending SYN_REC connection status. 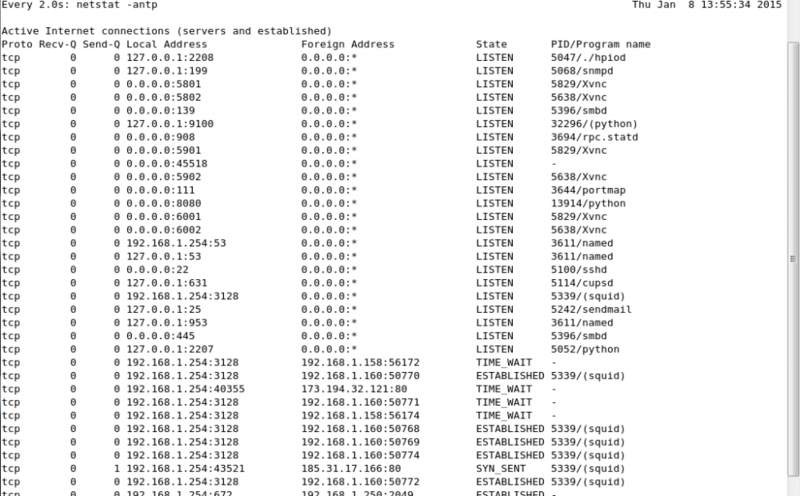 Use netstat command to calculate and count the number of connections each IP address makes to the server. List count of number of connections the IPs are connected to the server using TCP or UDP protocol. Check on ESTABLISHED connections instead of all connections, and displays the connections count for each IP. Show and list IP address and its connection count that connect to port 80 on the server. Port 80 is used mainly by HTTP web page request. Please note that you have to replace $IPADRESS with the IP numbers that you have found with netstat.